With a premium durable construction, it's sturdy and durable. The cabinet will make a great addition to your bedroom, kitchen, bathroom or any other room in the house. This surface is easy to clean with a damp cloth. Don't hesitate to add to your cart now! 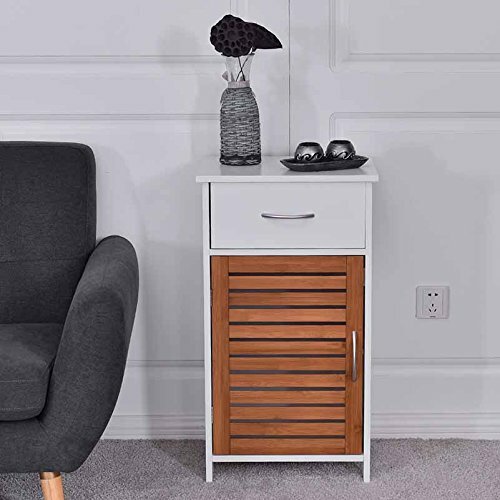 PREMIUM BATHROOM STORAGE CABINET: Sturdy construction made of engineered MDF material features solid and stable, used in shouldering your toiletries various kinds of bathroom essentials. It must be your reliable helper in organizing your bathroom. WIDELY APPLICABLE: Proper item dimension(17.0"x 14.0"x 31.0"(L x W x H)) and its bamboo elegant shutter door make it modern to complment any room decor. This bathroom cabinet can be widely applicable in bathroom, beside your bed or sofa and any any other room in your house. CONVENIENT TO USE: Come with pull handles and drawer roller glide with built-in safety stops, you can open and close smoothly and safely. This shutter door offer better ventilated to inner space, good to dry your cleaning staff after each time use. BUILT TO LAST: MDF construction with characteristics of rust resistance and moisture proof not only ensures this floor cabinet a long lifetime, but a durable utility. QUALITY QUARANTEE: Gentleshower guaranteed 90-day no questions asked replacement if you are not satisfied with our cabinet. Customer service ready to service within 24h. Manual included. If you have any questions about this product by WATERJOY, contact us by completing and submitting the form below. If you are looking for a specif part number, please include it with your message.